Personally selected by Rae, this 10 piece set is perfect as your own personal bag of tricks. I'm not one who usually gravitates towards brush sets, mostly because I always find there are a few brushes I just end up never using. But with this set, I actually end up using every single brush quite frequently, which happens like NEVER. Every single eye brush I can use to handcraft my daily look: (neutral but slightly smoky with lots of eyeliner winged at the ends and a clean filled in brow), bronzer and blush with the Deluxe Kabuki (bc honestly, I've been wearing only the IT Cosmetics CC Cream in Medium these days), using the Pro Powder brush to apply my RCMA No Color Powder to set everything, and the lip brush to apply whatever lipstick I wear that day. On the plus, Rae's brushes are so darn light that when I travel, they don't weigh my makeup bag down. The hairs are really soft too, so there is no scratchy feeling on my face or eyes. My favorite brush is probably Precision Bent liner brush - it's thin but allows me to get really detailed with my liner work or thicken as I go. Most importantly, the angle helps me to create a perfect wing, every single time. Although it was quite a splurge for me, I'm totally pleased with my set and plan on it using it for a very long time! ⭐️⭐️⭐️⭐️⭐️ Five stars! Correction to my previous post -I am new at this 😀 They are easy to clean and make application effortless. I have almost all of her brushes. 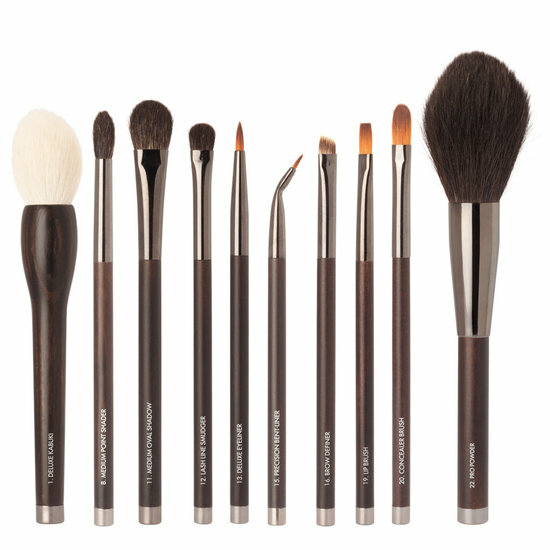 They are the softest brushes have ever used and the eye brushes make blending effortless. Better than Wayne Goss or Chikuhodo.